What’s your favorite candy? Imagine the taste in your mind’s mouth (if you can have a mind’s eye, you can definitely have a mind’s mouth). Imagine having unlimited access to that candy. It’d be sweet for a while because candy is delicious and sugar highs are fun but how long can you go before getting sick to your stomach or collapsing from post-sugar rush nap-olepsy? Welcome to St. Lucia’s sophomore album Matter, a synthy sugar rush of ear candy that approaches the brink of pop overindulgence. Don’t get me wrong, Matter is a really fun record to listen to. St. Lucia aka Jean-Phillip Grobler has a real gift for synthesizer arrangements and soaring pop hooks. Tracks like “Home” and “Always” are sunny anthems that might have been huge hits if only they were born 30 years earlier. Despite the overwhelming influence of 80s pop, Grobler manages to keep his songwriting and production crisp enough to sound contemporary. “Dancing On Glass” and “Physical” hit the sweet spot between old and new with sharp vocal samples complimenting pounding synth bass arpeggios and breezy choruses. As much as I can appreciate the blending of 80s pop tropes and modern flourishes, “Help Me Run Away” (cowritten with Jack Antonoff) is easily the most impressive song on the album and it’s pure 80s. Much of Matter seems comfortably accessible, if not borderline generic, but “Help Me Run Away” aims for more. It’s Grobler’s most compelling and enjoyable display of vision and execution but it also seems a bit like an outlier on Matter. This record struggles to balance the excessively saccharine with the substantial and perhaps that’s why the grandiose arrangements and cathartic climax of “Help Me Run Away” stand out so much. Grobler’s music sounds joyfully infectious on every track, but “Help Me Run Away” has a unique self awareness that simultaneously parodies and worships the 80s influences. With their hand crafted approach to 80s leaning pop, Matter makes for an easy comparison to Carly Rae Jepsen’s 2015 cult hit EMOTION. While Jepsen was equally reliant on 80s influences, she infused a wider range of sounds and imbued them with greater depth. St. Lucia’s 80s nostalgia is more narrow in both scope and tone that’s exactly why, despite their superficial similarities, Matter can sound disposable while EMOTION sounds indispensable. 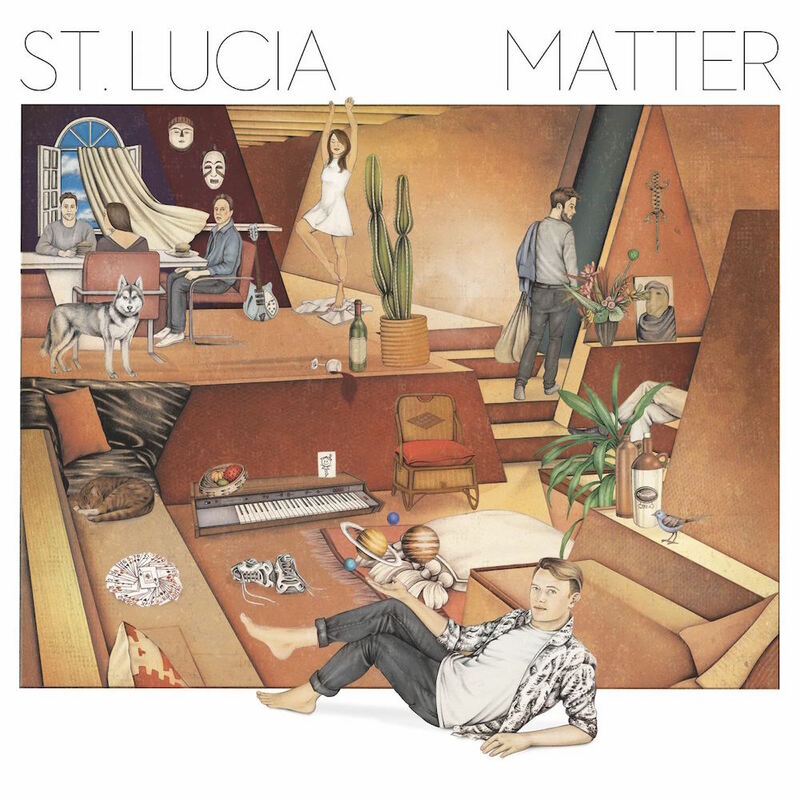 This album was introduced to me when my buddy sent me a link to Matter and enthusiastically proclaimed: “I’m only one track in, but the new St. Lucia is so far up your alley it’s almost comical.” He wasn’t wrong. I love crafty synth pop and Matter is a record I’ve had a lot of fun listening to over the past month since its release. Six months or a year from now, Matter might still be in my rotation. It might not. Either way, Matter is a really enjoyable record that delivers an ecstatic, if unsustainable, synth pop sugar high.